Moments before Jordan Burroughs took to the mats in the Las Vegas Convention Center for the ASICS U.S. Open on April 20, the 2012 Olympic gold medalist was asked to say a few words to the many fans that posed for one of the latest “Keep Olympic Wrestling” photos. 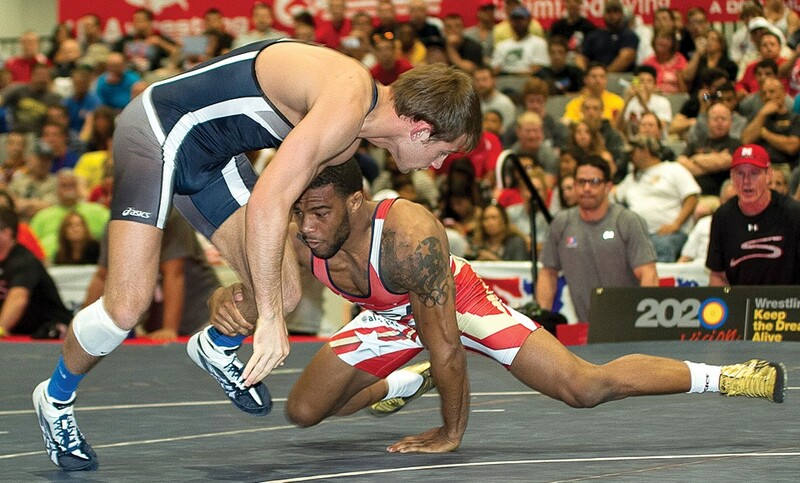 This final match at the 2013 ASICS U.S. Open in Las Vegas featured the 2011 and ’12 Hodge Trophy winners: Jordan Burroughs (right) and David Taylor. The former NCAA champ from Nebraska, World and Olympic champion won to solidify his top spot 163 pounds in freestyle. Among other things, Burroughs spoke about why it is important for fans to get involved in the task to change the minds of the executive board of the International Olympic Committee to drop wrestling from the Games after 2016. But what was most remarkable was that Burroughs didn’t even need to be in Las Vegas that weekend. For one thing, he and his fiancé, Lauren Mariacher, have an October 2013 wedding to plan. And when it comes to wrestling, the 24-year-old native of Sicklerville, N.J., already has a spot reserved in the best 2-of-3 Championship Series in June’s World Team Trials in Stillwater, Okla. Yet, the former Hodge Trophy winner and two-time NCAA champion from Nebraska felt it was important for him to compete in this year’s U.S. Open, where his 3-1, 1-0 victory over Penn State’s David Taylor put an exclamation mark on a second U.S. Open championship. But it wasn’t the U.S. Open award that Burroughs needed to add to his ever-growing trophy case. It was the fans … and the sport. “We don’t get a chance to wrestle that often on American soil that often,” Burroughs said. “Any time fans get a chance to see us compete, I’m all for that.